We offer you the best cooking apps for iPhone to spice up your time in the kitchen. Let’s find out what are the best recipe apps. Have a special occasion? Do not know what wine to match the dinner you have prepared? Do you want to vary the menu every day? Fortunately nowadays technology helps us in many ways, not only by offering simple recipes for beginners, but also excellent dishes worthy of the best restaurants of the world. 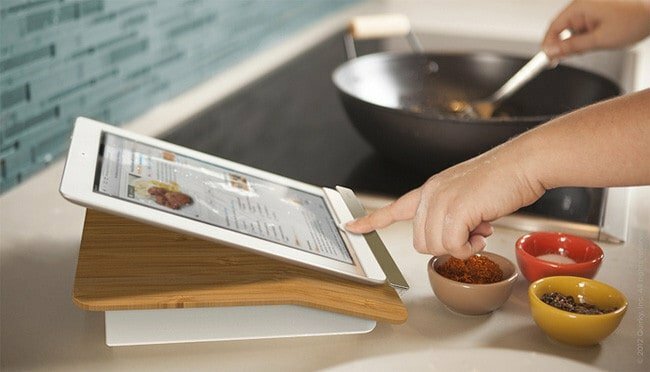 Here is the ultimate guide to the best apps in the kitchen. This guide is intended for beginners, and for anyone who delights in this noble art, in search of ever more elaborate and tasty dishes to be offered to friends or to cook at particular times. Kitchen Stories is an app that can guide the creation of recipes. Kitchen Stories offers thousands of recipes, accompanied by video of preparation, photos and detailed explanations on ingredients and preparation. The recipes are divided into categories and you can also create a shopping list. In this application you will find over 350,000 recipes, from the easiest to the most complicated. You can find the recipes in different ways, for example by low fat meals, very good choice. It also provides a tool to plan meals for the week and based on the recipes, generate a shopping list that contains exactly what you need for those days. One of the best cooking apps for iPhone. Food Network in the Kitchen brings you the best recipes from world’s most renowned chefs directly to your smartphone, so you no longer will have to sit through an episode to find out how to make baked chicken. It’s easy to learn, because you will not have to do almost anything: all are videos for you to be much more convenient and easy way to prepare all your recipes. Cook is a social networking application that will allow you to share your cookbooks and recipes with other users worldwide. A great application to know the gastronomic culture of other countries and get tips, recipes and new friendships. Evernote is not a cooking app. It is fantastic app to group the recipes, but is also a great app to create your own shopping list. If you really want to save a bit of time in the kitchen, you can create checklists of ingredients to add to your recipes. Then just copy and paste into your shopping list every time you go shopping. Because the lover of good food is also a lover of good wine, the App advises you a lot of cocktails, very nice the idea of being able to create a drink based on what you have in the fridge. Well … thanks to these iPhone recipe apps, cooking will be fun and easy. What is the application of this genre you use most? Which application helps you learn new recipes? Tell us in the comments, will be happy to meet new apps! You may also like: Best FREE iOS apps to decorate your home.